Our JFEW Scholars impress us endlessly with their ambition and drive. Their creativity and tenacity are an inspiration, and we are so proud to celebrate their stories and successes. If you are a current JFEW Scholar and would like to share your recent accomplishments, please email us at info (at) jfew (dot) org! Congratulations to JFEW/SUNY graduate, Erika! Our JFEW Scholar Erika Esquivel recently graduated from SUNY Geneseo! During her time at Geneseo she was honored at the annual Leadership Awards and Recognition Ceremony where she was recognized for her outstanding contributions to the campus community. Erika gave us some advice for incoming freshman. She says, "The most meaningful lesson I learned at SUNY Geneseo was to always shoot your shot. You have to take a chance and open doors for yourself, don't expect a door to open on it's own." Congratulations on your accomplishments, Erika! We can't wait to see where you'll go next. 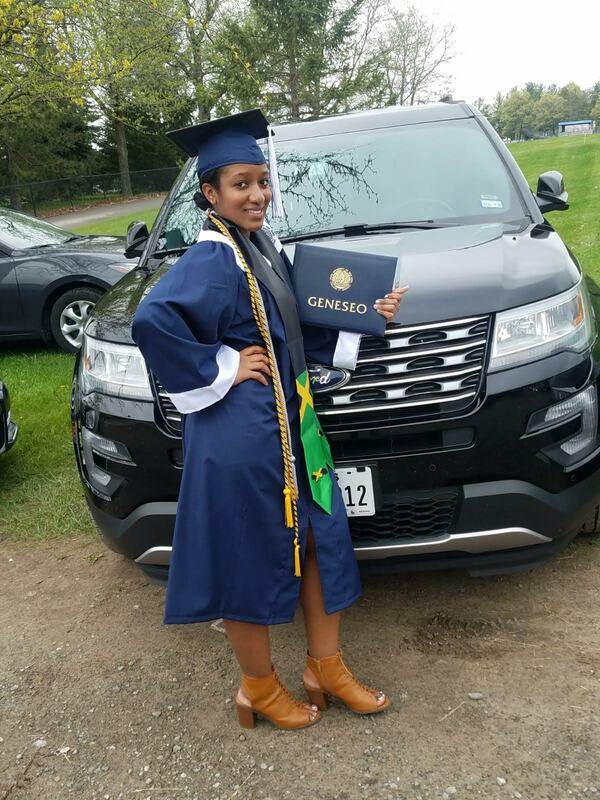 JFEW Scholar Druzell Smith recently graduated from SUNY Geneseo! Druzell says that her experiences at Geneseo completely pushed her out of her comfort zone because she was so far away from home. She says of her experience, "College was a completely different ball game; every class, professor, and semester brought a new and different challenge. If there was one thing I wish I knew [freshman year] it would be that the people around you could be your biggest support. Don’t be afraid to talk to your professors and get advice from them. Talk to your peers and see what they are doing to be successful. Get help if needed and if and when you fall just remember that the most important thing is to get up dust yourself off and keep going." Druzell says that her most proud accomplishment while at Geneseo was starting the Give Back Book Drive on campus. She had the idea for the book drive her Junior year after realizing how many old textbooks she still had that were in good shape. She realized that if she created a place where people could donate their old books for future students to utilize she could greatly help fellow students and peers who might struggle to afford their textbooks each semester. She says, "The program was one of my most meaningful accomplishments because there were times when I struggled to obtain my textbooks. I am happy that I was able to do something that would help people for years to come. My advice would be to try and make a difference, whether big or small do something that will help those around you." Druzell, you are an inspiration to us all! JFEW Scholar Lydia Senatus recently graduated from Stony Brook University! Lydia graduated with a degree in Economics after deciding to make a switch from Health Sciences after her freshman year, and she says that her decision to switch to a major that she truly enjoyed was one of the best decisions she made in college. While in school, Lydia worked as a peer mentor to assist fellow students and peers in applying to college scholarships. Every semester she hosted writing workshops to assist students in making their applications much stronger, and improving their ability to fund their education. She says of her experience, "I think the most important part of creating a legacy is not what you as an individual have accomplished, but rather how you have helped other people with their accomplishments." Lydia, we are so inspired by your tenacity and drive, and we can't wait to see what is next for you! Congratulations to JFEW/SUNY graduate, Allyson! What was the most meaningful lesson that you learned while in college? "The most meaningful lesson I learned in college is that knowledge truly is power and every experience and opportunity you can take advantage of, you should. Never be afraid to put yourself out there and always work hard to try and achieve your goals." What do you wish that you knew when you were a freshman? "I wish I had known that it is okay to make mistakes and it is okay to put yourself out of your comfort zone. This is how you become a stronger person both academically and personally." What was your most proud accomplishment during your time in college? "My most proud accomplishment during my college career is hard to determine, I have had many moments that made me proud of myself. One of the big ones would be getting accepted into the JFEW SUNY program." We are so proud of you Allyson, and we can't wait to see where you'll go next! Elana is a Junior at Stern College for Women and a double major in Biochemistry and Computer Science. This past fall she participated in the Yeshiva University hackathon where she had the opportunity to engage with, and meet other computer science students. She says she was extremely impressed by how much they were able to accomplish in 24 hours by collaborating together. Because of her experience, she was inspired to organize an all-women's hackathon event at Stern College to help bring confidence to her female STEM peers and encourage them to get involved. She says, "By making the event more accessible to all levels, I hope to inspire others to participate in future hackathons." Additionally, Elana is also on the board of the Computer Science club at Stern, where she helps to plan events such as the hackathon, and is a co-editor of Derech HaTeva, which is a bible and science journal at Stern. Elana was also recently invited to compete in the Google Games computer science competition where she and her teammates worked to solve a variety of puzzle games. We are so impressed with Elana's passion for the STEM field! Tamar, a senior and double major in English and Judaic Studies at Binghamton University debuted a photo exhibition titled, "With Love, From Rosario". Last summer, Tamar was given the opportunity to travel to Rosario, Argentina as a Harpur Fellow to volunteer as a teaching assistant. She says she was able to make connections with people and examine Jewish culture through community service. Check out this wonderful article about her experiences in Argentina and the photo exhibition that she put together upon her return. Brianna spent this past December organizing a Christmas toy drive. She collected more than 300 toys that were brought to Cohen Children’s Medical Center and Saint Mary’s Hospital for Children. Afterwards, she was overcome with the amount of love and support that she had received and she decided to turn her event into a philanthropic club. Brianna launched the Facebook group Acts of Kindness, that is dedicated to organizing two giving events per year with a mission to spread love and hope to those in need. Currently, she is working on an Easter basket drive that will be given out to the homeless and needy community in New York City this April. We are so proud and inspired by the amazing work Brianna is doing to bring love and hope to her community. Like Brianna, JFEW believes that acts of kindness can change the world! ** Please follow and like Brianna's Facebook page, Acts of Kindness to get involved or donate a toy! Vera is a member of the Hunter College Women’s Cross Country, Indoor, and Outdoor Track & Field Teams, as well as a Biology and German major. She uses cross country and track as a way to organize her busy schedule, and she says, "you have to be self-motivated and disciplined if you want to do well." In addition to being a scholar-athlete, Vera is a Democracy Coach for the Generation Citizen program where she works with 11th graders in the Bronx. Vera believes it is important for young people to be a part of the decisions being made in Albany and Washington, D.C., and her goal is to help students solve the critical issues their communities are facing. Her current class is focusing on a way to implement more college scholarship opportunities for low-income students. Vera, we can’t wait to see what you will accomplish next! Talia is a senior at Stern College studying biology, and she is an active member in a variety of clubs. She is currently the president of the Yeshiva University Sharsheret Club, which is dedicated to funding research to find a cure for cancer. Talia said she was initially drawn to the club because of the enormous presence that it has on Sterns’s campus, and since joining she has been inspired by the work they are doing. As president, she is beginning to prepare for the club’s major event, Cake Wars, which will be held this February. The event brings in around 300 to 400 people annually! In addition, Talia is also a member of START Science, which is a club at Stern that seeks to get younger children excited about learning science. As a member, Talia makes trips to public schools in the area to teach and inspire younger students to get involved in her passion. Talia will graduate from Stern this spring, and is planning on applying to physician’s assistant programs. Good luck, Talia! ** Talia is pictured here with her friend, and fellow JFEW Scholar, Tzip Roffe! "Being a cancer survivor has given me a newfound purpose in life, and a part of that is my desire to work in the medical field. I know this is the right career path for me because I have the empathy this job requires. I have been in a similar situation and can personally relate with the patients that I encounter every day. During my treatment, my medical care team left an imprint on my heart, and they have inspired my involvement in the patient and health care field. Continuing my career in medicine will allow me to help encourage and support individuals who are trying to find reasons to fight their sickness. Additionally, with further education, I am interested in advancing my career into other diagnostic modalities such as CT, MRI & Mammography.